For many people their wedding day is the most important day of their life. All eyes will be on you and your photos will create lasting memories to look back on for many years to come. At Hyde Park Dental Care we want you to look your very best and be confident with an amazing smile. So why shouldn’t you have that picture perfect, dream smile? Hyde Park Dental Care offers a range of cosmetic dental treatments to help rejuvenate the appearance of your smile in time for your big day! Your wedding day is one of the most important days of your life, so why not look your best? Combine one or more of our cosmetic dental treatments as part of a wedding smile makeover package today! Click here to book your consultation. At Hyde Park Dental Care in Sydney CBD we offer both in-office and take- home teeth whitening. For our in-office teeth whitening solution, we use an Australian Manufactured product – PolaOffice. This treatment can help to whiten your teeth by several shades in just over an hour. The results can be noticed immediately. You will also receive a complimentary take-home tray and gel to maintain and/or top up your whitening treatment, when required. Alternatively, if you would prefer to whiten your teeth in your own time at home, we also offer take-home whitening. This is a more gradual approach achieving the same result at a lower cost. Your take- home whitening kit will include custom made teeth whitening trays and gel. All teeth whitening products used by Hyde Park Dental Care have been approved by the Australian Regulatory Body (TGA) and are more effective than ‘over the counter’ products. 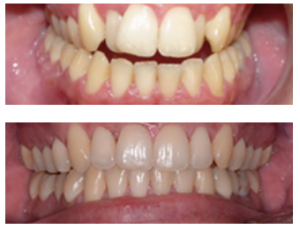 An amazing result was achieved in just 2 weeks with the take home teeth whitening system. These days creating a healthy, straight smile doesn’t mean bulky metal brackets and wires. If you would like to straighten your teeth discreetly and effectively, then Invisalign might be the solution for you! Using a series of custom-made aligner trays, Invisalign works to slowly move your teeth into the desired position over a period of months. The timeframe in which Invisalign can be completed will depend on the complexity of your condition. Each set of aligners is worn for approximately two weeks before graduating to the next set of aligners in the treatment plan. Because you are given 3-4 sets of aligners at each visit, you will only have to visit the dentist every 6-8 weeks. Invisalign works best for patients who have mild to moderate crowding, spacing or misaligned teeth, but will be assessed on an individual basis. Hyde Park Dental Care offers a complimentary assessment to determine whether you are a suitable candidate for Invisalign treatment. SnapOn Smile is a new and innovative dental treatment that provides patients with a brilliant looking smile that is removable, comfortable and involves no modification of the existing tooth structure. SnapOn Smile is made from highly durable, stain resistant materials, which are custom-fitted to your individual smile. Depending on your exact concerns, SnapOn Smile can be made to cover specific areas of your smile or even full upper/lower arches. Just as the name suggests, this device can simply be snapped on and off without the need for extensive dental procedures. SnapOn Smile is great for people who are looking to improve the appearance of their smile affordably, quickly and effectively.